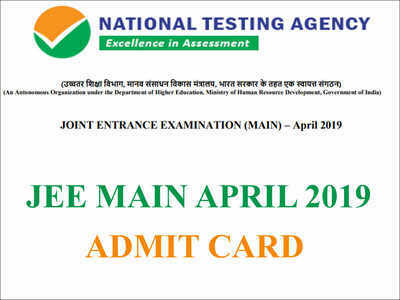 NEW DELHI: The National Testing Agency (NTA) has released the Joint Entrance Examination (JEE) Admit Card for JEE Main – 2 April 2019 examination. The notice posted on the official JEE website reads: “The National Testing Agency will be conducting the Joint Entrance Examination (Main) – April, 2019 in Computer Based Test (CBT) mode at different Centres located in different Cities throughout the country and abroad from 7 th April, 2019 to 10 th April, 2019 & 12th April, 2019. Candidates should carry any one of the authorized photo IDs (must be original, valid and non-expired) – PAN card/ Driving License/ Voter ID/ Passport/ Aadhaar Card (With photograph)/ Ration Card on the examination day.